This presentation focuses on three major areas, Strategic Design, Match Planning/Execution, and Scouting. Rather than spending time on equations and detailed calculations, the Strategic Design gives a more high-level overview of how to design an FRC robot. This portion of the presentation includes sections on such often neglected strategic design areas such as Game Analysis, Chokehold Strategies, Cost-Benefit Analysis, Task Prioritization, and Tradeoffs using a case studies from past games. The Match Planning/Execution section of the presentation discusses effective habits and strategies that will help lead a team to victory. This is a must for those who enjoy the strategic aspects of FIRST. The Scouting section deals with effective techniques to collect information on your partners/opponents, and how to make the most of this data. Advanced statistical metrics analgous to "Sabremetrics" in baseball will also be discussed. The presentation is filled with entertaining and insightful historical FIRST anecdotes from the past 14 years. With the information in this presentation, you can turn your team from a mere competitor to a perennial powerhouse! 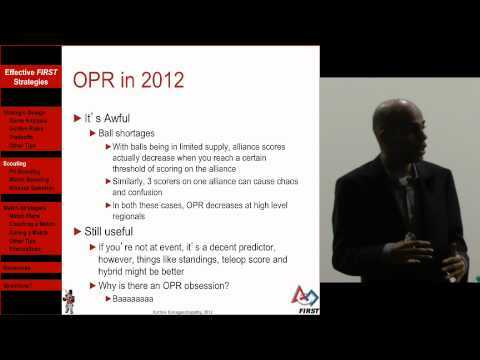 Presented by Karthik Kanagasabapathy on April 25, 2012 at the 2012 FIRST Championship.